Start earning Cash Rewards on your hotel stays - it's free! Log in to your Guestbook account. Change or reset my password. One last step for security! Before continuing, we need to verify your email address. Please check your inbox for a confirmation link. within a few minutes, we can resend it to you. Before continuing, we need to verify your email address. Please check your email () for the confirmation link we sent to you previously. If you can’t find it easily, we can send a new link now. A password reset email has been sent. The easiest way for you to add this email is withThe easiest way for you to enroll is with . that you utilize 's account security features. Prefer to add this email with it's own password?Prefer to create an account with a password? Click here. Let's add a password so you have an option to login with this email. Let's finish your account setup! Choose a password with at least 8 characters. 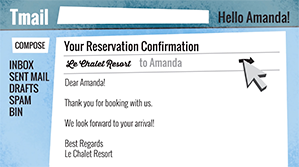 We capture reservations from theguestbook.com and from many (but not all) of our hotels' websites automatically. If a reservation is missing, please forward it to rewards@theguestbook.com or upload it directly to your account. Our special rewards tracking option. it directly to your account.